IoxHost Review 2019: Is IoxHost a Good Hosting? IoxHost is based in the U.K. It has been in business since 2009 and offers a nice selection of hosting services using U.K based servers. IoxHost is a U.K. based website hosting provider. It was founded in 2009 with the aim to provide affordable, good quality hosting to small and medium sized businesses. It has many positive customer reviews, as well as a good sized social media following. Its website and support are in English. IoxHost has servers located in a U.K. data center, with an uninterrupted power supply, 24/7 monitoring, and 100MBit/s to multiple 10Gbit/s connectivity available for clients. It’s not clear what the uptime average is, however, client reviews do state they’ve experienced 100% uptime. Also, independent speeds tests have shown the IoxHost network to be the fastest network in the U.K., and third fastest network in the world. It also commits to never overselling its server space. IoxHost uses robust Dell and SuperMicro servers for high performance and reliability. Also, customers all have access to cPanel, which is a widely used control panel for its ease of use, compatibility, and reliability. All shared hosting plans come with a premium version of Softaculous one-click installer, with over 300 programs included. There are four packages of shared website hosting available: Small, Medium, Large, and Deluxe. The packages range from 2GB disk space, 20GB bandwidth, and five add-on domains, to 5GB disk space, 50GB bandwidth, and ten add-on domains, to 15GB disk space, 1000GB bandwidth, and twenty-five add-on domains, to 35GB disk space, 250GB bandwidth, and unlimited add-on domains respectively. Compared to some larger, international companies, the prices are quite high. However, for a U.K. provider with servers located in the U.K., the prices are satisfactory. SSL certificates are an added cost on all plans, while domain registration is free for annual plans, excluding the base plan. Plans can be bought in one, three, six, and twelve month plans, with the monthly price quite steeply reduced for longer term contracts. There is a no questions asked 30-day money-back guarantee on all shared and reseller hosting plans. To get support, you can contact the support team by ticket or telephone. There’s also a customer portal, although it’s only for logged in existing users, so it’s hard to tell whether there is more support e.g., a knowledge base, live chat, and so on, available. I find it a little lacking that the business hours are not advertised, however, they do claim an average twenty minute resolution (not response) time on tickets. IOXHost is a U.K. based host providing good quality hosting. It uses U.K. servers, has a good money-back guarantee, and a fast response time to tickets. Check out Ioxhost’s web hosting options today! 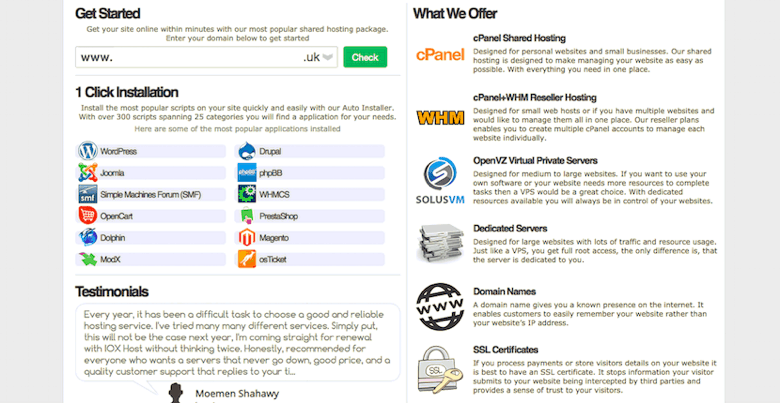 Wondering how IoxHost stacks up against other Web Hosting companies? Enter any other Web Hosting company and we will give you a side-by-side comparison.